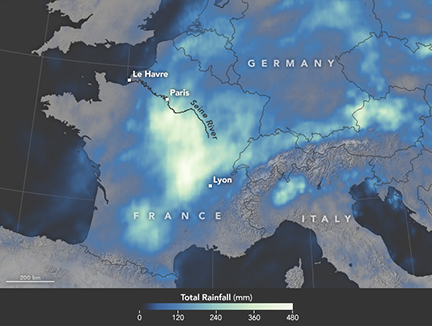 In June 2016, a slow-moving weather system unleashed several days of heavy downpours on western Europe, pushing the Seine River to heights not seen in 34 years. With the Seine’s water levels 6.1 meters (20 feet) above normal in Paris, flood waters knocked out electricity for thousands of people, interrupted road and rail traffic, shut down schools, and caused an estimated 1 billion euros of damage. During the worst of the flooding, the world’s most visited museum, the Louvre, closed as employees scrambled to move artwork out of basement areas that were at risk of flooding. • Dean Emeritus Charles Hosler was interviewed by Patty Satalia for the show Take Note. • A poster by Ryan Baxter, Kirby Calvert, and Bill Limpisathian titled “Spatial Analysis of Biofuel Production Potential in Northeastern United States” won Best in the “Combustion/Catalysis/Gasification” categories at the PSIEE Energy Days 2016. This summer, three Penn State students and one alumnus will travel the globe as part of the U.S. Department of State Critical Language Scholarship (CLS) program. Eden Kinkaid, Erika Pugh, Janet Purdy and David Stack are among the approximately 560 U.S. undergraduate and graduate students who received a CLS scholarship in 2016. Each will spend eight to 10 weeks receiving fully funded, group-based intensive language instruction and taking part in structured cultural enrichment experiences in one of 24 overseas locations. Reforms are needed to the world humanitarian aid system to better serve the needs of refugees, some observers say. One issue is a lack of coordination among aid groups, says Indiana University geographer Elizabeth Dunn, who has studied camps for displaced people in the country of Georgia. Leaders gathered to discuss the issue at the World Humanitarian Summit, in Turkey, this week. Disturbances influence vegetation patterns at multiple scales, but studies that isolate the effect of scale are rare, meaning that scale and process are often confounded. To explore this, we imposed a large (~3.75 ha) experiment in a South African coastal grassland ecosystem to determine the spatial scale of grass response to nutrient additions. A Social Media Campaign for Promoting Active Travel to a University Campus. Context: Promoting regular physical activity can be challenging. Active travel (AT), walking and biking for transportation, is a way to achieve more activity, but rates remain low in the United States. With increased technology use, social media is one way to expand reach. Objective: The purpose of this study was to describe the reach of social media in a campaign to promote AT to a university campus. This entry was posted on Wednesday, June 8th, 2016 at 2:38 pm	and is filed under Uncategorized. You can follow any comments to this entry through the RSS 2.0 feed. Responses are currently closed, but you can trackback from your own site.